We’d love your help. 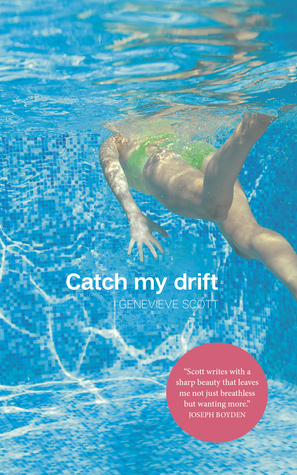 Let us know what’s wrong with this preview of Catch My Drift by Genevieve Scott. To ask other readers questions about Catch My Drift, please sign up. Catch My Drift captures the imagination. An inside look at both mother and daughter and the space between, CMD's interlocking stories weave a beguiling, affecting thread. Highly recommended. A depressing story of a promising athlete turned victim. Brilliantly crafted mother-daughter story. I was left feeling hopeful for human relationships. This review has been hidden because it contains spoilers. To view it, click here. If you know how hard it is to be a mother or a daughter, this book will be a hard read. It tells different stories from mother Lorna and daughter Cara. They exist as their own person but there’s this yearning that any daughter/mother can understand. That desire to connect, to be what is expected of them, but also to hope for more from the other. Cara wishes her mother taught her how to swim in some of her fondest memories, since she was almost an Olympian, after all. Lorna wishes Cara would find h If you know how hard it is to be a mother or a daughter, this book will be a hard read. Cara wishes her mother taught her how to swim in some of her fondest memories, since she was almost an Olympian, after all. Lorna wishes Cara would find her thing to be passionate about, to excel in. The daughter wishing for a connection, the mother wishing for progress. This is the deep, in the pit of your stomach reminder that someone who is a part of you has existed before you, and will exist without you as well. I find the book thoughtfully written, touching gently on different aspects of life through a mother/daughters’ eyes; drivers’ test, first period, a job interview, a workplace flirtation. I don’t get the sense I’m being taught a moral from any of the stories, more like I’m being invited to view them and come to my own conclusions. I loved the book, however I find it wanting for not including an aspect of Lorna while she’s battling cancer. Perhaps it’s because all the women in my family are also battling cancer, but I would have appreciated the view through Lorna’s eyes. Would she still be as thoughtful? Would she notice the smell of alcohol on Cara’s clothes? Would she want to know about Lee? I love a good vexed mother-daughter relationship. This book is a dynamite example of just that. The writing is crisp and witty and you get a good sense of the characters over the course of the book. A truly satisfying read!